Here’s everything you need to know about properly caring for your body piercings, whether they’re old or new, to ensure proper healing and a beautiful piercing that will last for years to come. Proper care of nostril piercings is especially important because they are often exposed to all of the bacteria that your body is trying to rid itself of when you get sick and experience a draining nose. Constant blowing of your nose can irritate your piercings and make them more susceptible to infection. If you start seeing signs of swelling, your piercing is hot to the touch, or you start seeing green/bloody drainage from around the post of your nostril piercing, you may have an infection. The pierced area may also become sore, even more sore than when you originally got it pierced. If the problem persists for more than a few days with your regular cleaning routine, or if you notice red streaking, an increase in pain and discomfort, or you have a fever, seek the advice of a doctor. If your piercing is still healing, you may experience drainage as well. The wound needs to drain in order to heal, and the drainage will be a white/yellow color. This just calls for the use of aftercare. Our ‘Wash-It! Soap’, and Soak It! Sea salt is helpful in removing any drainage topically from building up around your and under your jewelry. Eyebrows and other facial piercings are also subject to infection if you regularly touch them without washing your hands. Be sure to leave the piercing alone as much as possible and do not rotate your jewelry. Facial piercings of any sort require glycerin soap washes and sea salt soaks to heal. The glycerin soap is used to remove make-up, face wash residues, and any other build up that may accumulate throughout the day. The ‘Soak-It! Sea salt can be used to clean out the inside of the piercing. It’s best to soak the piercing 2-3 times a day. You will want to use ¼ teaspoon of salt to 1 cup of warm water into a dixie cup or clean shot glass and submerge the piercing fully, letting it soak for 3-5 minutes. Piercings on the ear accumulate a lot of residues from shampoo, conditioners, and hair products. Our glycerin soap can be used last in the shower to help remove some of this build up. Sea salt soaks are also a good idea to clean any drainage from the inside of the piercing. Tongue and lip piercings require proper care because they are likely to come in contact with a wide range of food and drinks, not to mention your romantic partners. Any piercing that leaves a piece of the jewelry inside of your mouth will require a special cleaning regimen to prevent infection. 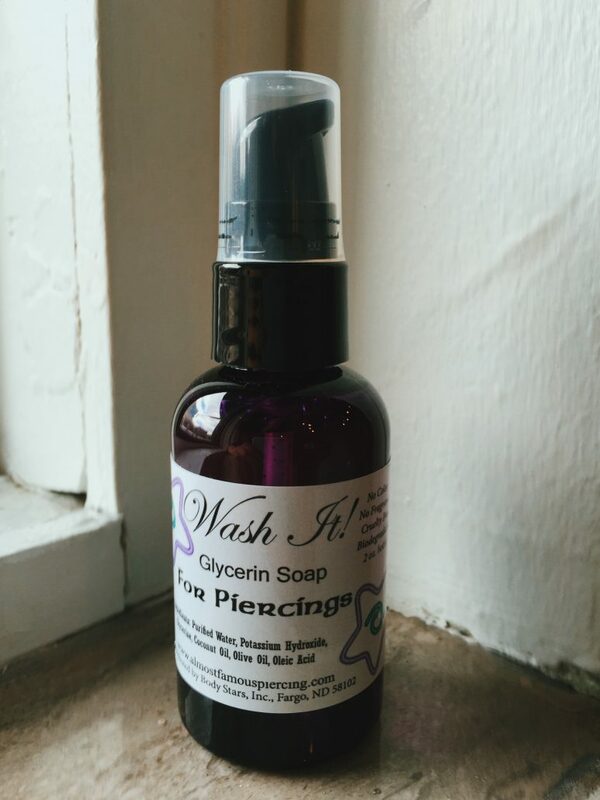 You should clean the outside of your piercing with “Wash-It!”, our pure glycerin soap. However, you should also use a sea salt and water mixture to swish around in your mouth and clean the inside portion of the piercing. When you get an oral piercing done with us, we also sell our “Swish-It!” mouthwash which should be used two times a day. Navel piercings are one of the most challenging piercings to deal with when healing. These piercings in particular can take up to the full six months to one year to completely heal. In the meantime, you want to avoid heavy jewelry or jewelry with long dangles. Swelling around the navel after the piercing is normal and the area will remain tender for a few days as well. However, if you start noticing a lot of green or bloody drainage, seek medical assistance. If your body jewelry feels tight from inflammation, come back into any Almost Famous Body Piercing locations so one of our piercers can check the piercing for you and suggest a change out to a longer piece of jewelry if needed. Clean the piercing twice a day with the glycerin soap and 2-3 times a day with the sea salt and water soaks. These types of piercings tend to be very delicate, and you are probably already doing everything you can to avoid injury. However, due to the potential for contact with bodily fluids, you need to be extra vigilant in your care of these piercings. Clean several times a day until healed, and continue to clean your jewelry on a regular basis to avoid any harmful buildup. Make sure to inspect the area regularly for any signs of swelling or pus. As with all other piercings, seek medical help if you notice anything outside normal signs of healing, inflammation, redness, warmth, and clear to pale yellow drainage. Caring for your other body piercings, including surface piercings, is similar to the above mentioned piercings. Just make sure you keep things clean and use an approved cleaning solution to protect your piercing. If your piercing continues to get worse with time and you notice extreme changes, seek medical treatment immediately. Visit Almost Famous Body Piercing if you need advice. Our experienced piercers can answer and questions or concerns you may have with your new or healed piercing!